How do I get rid of the Antivirus Pro 2009 Virus? Those are the exact words I Googled when I found out we had been infected by the virus on our home network last Friday night. Three days later, I’m here to tell you, BEWARE, WARNING, DANGER, CAUTION! 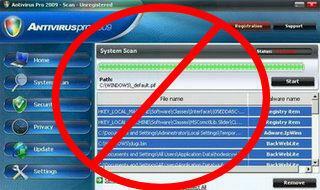 If you are reading this post, and you have been infected with the Antivirus Pro 2009 Malware Virus, STOP HERE!. This is the ONLY way I have found that will effectively kill and remove this “monster virus” from your PC computer. I’ve tried every possible site, scanner, bug-fix, free application, and removal instruction, ALL to no avail. After two days of (real-time) on-line battles with one of the nastiest, most malicious virus, Rogue AntiSpywares out there, today, I finally found the cure, the complete removal and fix. This virus has many names, and it will usually appear as a pop-up warning in your system tray that tells you “Spyware has been detected on your computer“, then it coaxes you to run their program to remove it. DON’T DO IT! Do NOT click on that pop-up bubble or the warning that appears. Not even Norton was able to detect this one sneaking onto our home network. Not knowing, my wife made the mistake of clicking on it. Here is the known Danger level on a scale from 1 to 10. It is so bad, that as fast as people are posting instructions and creating solutions to fix it, AVP2009 goes into your computer, and disables all the tools and applications that are created to kill it. This is no joke! Katerina Gasset had the same virus, but with a different name, and now even her instructions won’t work. This is one of the worse virus’s I have ever had to tackle. I spent hours researching this so you won’t have to. How Do You Get Infected with It? There are many ways your computer could get infected with Antivirus Pro 2009. It can come bundled and hidden with shareware or other down-loadable software. Maybe watching a video, and a pop-up requires you to download a codec file that has it attached etc. The worst part is that it looks legit. What can the Antivirus Pro 2009 Virus do if not removed? THIS IS ONE SCREEN TO AVOID AT ALL COSTS! THIS PROGRAM WILL COMPROMISE YOUR SECURITY. IT CAN SEE YOUR PASSWORDS, LOGINS, ACCOUNT NUMBERS, ANYTHING YOU TYPE OR ANYWHERE YOU GO! Here’s The Solution I Found after Numerous Calls, Reading, and Research. I’m not going to post the exact instructions, as it will only aid the creators in developing yet another way to prevent you from fixing your computer. Instead, Here is the solution, it’s the only company and application I found that could do the job! They are the real deal. Malwarebytes.com. I’d also add AVG antivirus before or after. They had to remotely access my system, run it in safe mode, run various scans, apps and cleaners, rename and remove files, reboot multiple times etc. Even as an experienced (protected) PC user, I still couldn’t have done it without their help. This could happen to anybody, don’t think it can’t happen to you.